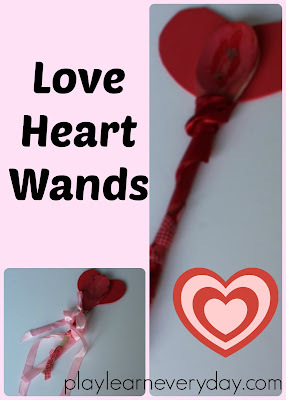 We made special love heart wands for Valentine's Day! We've been saying that we're being love fairies, but you could also use them for playing cupid. We often make wands and playing fairies is a game we really enjoy in this house, but the wands often break and so we were looking for something a bit more sturdy, so we tried wooden spoons and they are the perfect choice! Very robust and easy to decorate! We started by painting our wooden spoons with red and pink paint, then left the paint to dry over night. When the paint was dry I set out trays for Ethan and Ivy to choose how they wanted to decorate their wands. I had cut the foam sheets into large heart shapes and gave them ribbons, heart confetti, glue, tape and glitter glue to decorate their wands however they wanted. Ethan chose to wrap the ribbon all the way around the wand first, then asked for my help just to tie it onto the end, he then wrapped the red washi tape around it as well. Then he stuck the heart onto the wand and used glue to stick little pieces of heart confetti onto the other side of the spoon. Ivy loved the glitter glue and confetti, they were her favourites and she wanted to use lots of them! She needs a bit of help to squeeze the glitter glue pens, but she just loves the way that it looks and could play with it for ages! She also loves tape at the moment. So after tying the ribbons around the wand for her, she then wanted to wrap some pieces of red washi tape around it as well. Then we left all of the glue on our wands to dry so that we knew that they were really secure, and they are ready to play with now! If you're looking for more Valentine's Day crafts using wooden spoons, we also made the Wooden Spoon Love Bugs over on Crafty Morning!